Antidepressant prescribing increased dramatically in the last two decades, but the majority of prescriptions are written by primary care physicians and have not been related to a diagnosis of depression, said Mark Olfson, M.D., M.P.H. (left), at APA's Institute on Psychiatric Services in San Francisco this past weekend. 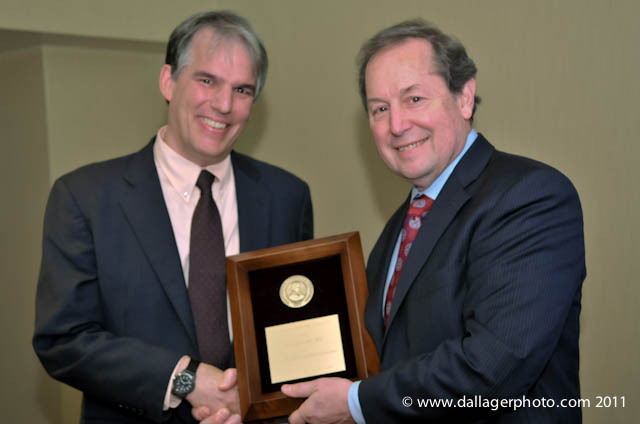 Olfson received the APA’s Health Services Research Award from APA Director of Research Darrell Regier, M.D. Olfson provided an overview of trends in antidepressant prescribing that include the following: increasing rates across all ethnic groups except African Americans, decreasing use of psychotherapy, decreasing use of combination psychotherapy-psychopharmacology despite evidence that it is the most efficacious treatment, and high rates of early discontinuation of antidepressant therapy. For further coverage of Olfson’s research, see Psychiatric News.